This is an original 1st Day Of Issue for DR. ANTONIO MA. 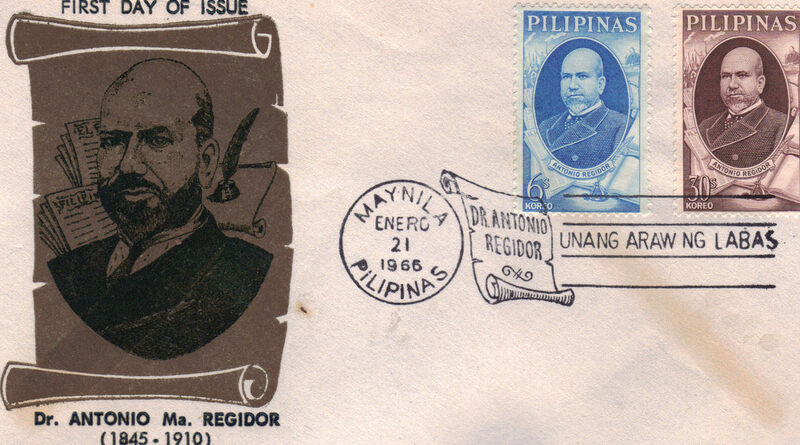 REGIDOR (1845-1910) issued in Manila January 21st 1966 stamped as well. Antonio Ma. Regidor y Juan was a lawyer, diplomat and propagandist. Despite being of Spanish parentage, Regidor supported the Secularization Movement and the nationalist propaganda in the Philippines. Measures 6-1/2" L x 3-5/8" H Embossed design Weathered by age and storage, has storage marks otherwise, in exceptional condition. Send email if you need additional details. Buyer is responsible for 1.95 shipping to anywhere in the USA Canada. Send email for international rates. Do check the store for many more Las Vegas Collectibles daily. Thanks for stopping by!